“’Twere Christmas Eve an’ mist a-crept off the crick. 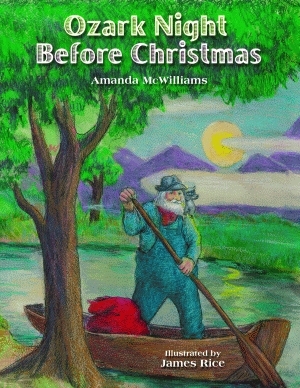 It’s a winter night in the Ozarks, and while Maw and Paw are snoring in their beds, their son is waiting up with his dog, Arkansaw, to catch a glimpse of Saint Nick. Amanda McWilliams was born in Little Rock, Arkansas. She spent her childhood summers and holidays visiting her grandparents in Little Rock and in Willow Springs, Missouri, where she fell in love with the Ozarks. Ms. McWilliams holds a BA in anthropology and an MA in education from Tulane University. She has served as program director and curator for New Orleans-area museums and as a volunteer coordinator for the Girl Scouts. Ms. McWilliams lives in Mandeville, Louisiana, with her husband and son. Widely acclaimed as the South’s leading illustrator of juvenile books, James Rice illustrated and/or wrote over sixty books, including all eighteen of the books in The Night Before Christmas Series. There are almost two million copies of his books in print. Mr. Rice taught art at the grammar-school, high-school, and university levels and enjoyed talking to thousands of schoolchildren across the country about writing and art over the course of his thirty-year career.